Drive Medical Deluxe Pin Style Pull Cord Patient Alarm from HealthyKin.com easily secures to a bed or chair with a self-contained clip. 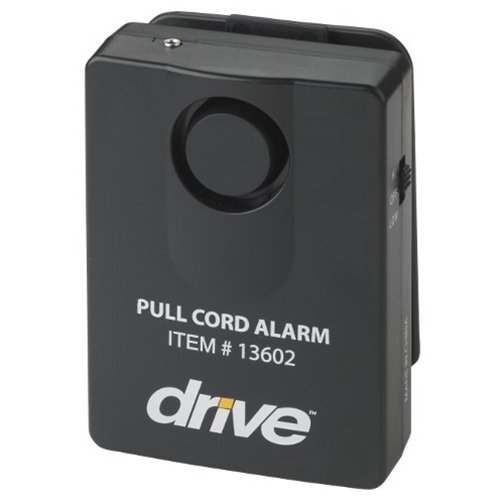 It features a pin-style activation cord (adjustable from 18" to 36") that pulls when the user moves, dislodging the pin from the alarm unit and activating the signal. The alarm includes two volume settings (97 dB and 103 dB) and can be deactivated with the On/Off switch. The product requires one 9V battery to operate (included) and is protected by a 1 year limited warranty. Activation cord is adjustable from 18" to 36"